Croswell's zip code is 48422. I lived in town from my infancy until the folks moved to a new-built home on land my grandparent's gave them south of Lexington. I saw my first-ever movie in a theater there, Mary Poppins, when it was then in 'first run' theaters. That had to be very shortly before the place closed. I also recall the folks taking me for one or two more movies, mostly WW II flicks with themes considered a little too grown-up for a 4-year-old, and when somebody'd get killed or whatever, my Dad who sat on one side of me and my mother on the other, would both cover my eyes, thinking that kept me from seeing. I spent a whole lot of those movies enduring that 'parental censorship'. But war flicks of every kind remain my favorite to this very day. That's probably what also led to a career in the military from '81-'96. Fond memories of that place, but I recall being really disappointed when it became an auto parts store, because that meant I'd no longer be able to get popcorn there!. I worked there a couple of times changing carbon arcs in the projector. When I was there the movie showing was The days of Wine and Roses This would have been early 60's and the Teslucks were the owners. My cousin just acquired the old Maxine theater sign that was above the screen. We can see writing under the paint in the scrolls. On the left side we have determined that it says TALKING : SINGING : DANCING. We can't quite make out what it says on the right side scroll. We think it says HEAR : ______ YOU : ______ SEE ?? Any ideas of what it could say would be appreciated. I used to work there, changing the marquis and taking tickets in the 1950''s, maybe 1954-55. I worked with a girl named Shirley Labadie. She sold tickets. Sam Burrows was owner and manager. There was no balcony when I was there. My brother, George Benko, was part owner with Charlie Whitebread. It is at 91 North Howard Avenue. 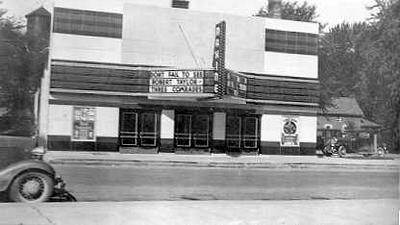 The Maxine opened July 5, 1920. The first film shown there was Romance and Arabella. It sat 650 people. Theres conflicting memories with town elders as if it had a balcony or not. It probably did. I am the proud owner of one of the pull chain urinals from the Maxine. The last owners were the Teslucks. Old man Tesluck ran adult films there at night. The Maxine closed October 31, 1964. It was named after the builder, William Carter's daughter, Maxine. August 1958 - Bill Clark is taking over buying for and booking of films for Alex Dubovenko's Almont Theatre at Almont and for the two run by the Tesluck family, the Yale at Yale and Maxine at Croswell. The last movie shown there was The Beatles A Hard Days Night. Charles Whitebread ran the maxine for a number of years for owners william carter, sam burows, and the last owners, a mr. and mrs. duncan. The operator from about 1935 to its closing in 1965 was Charles Whitebread. He was the manager and head projectionist, however, he didnt own it. He was also the postmaster in Croswell.